My kid started kindergarten yesterday, he looked so happy waiting of his new teacher. A backpack loaded with all the school supplies on his backpack.. Now I know why back to school for the kids are happy and excited. Fortunately, he was well prepared for the first day of kindergarten. he woke up very early it makes me surprised because he's up sometimes 9. I think he got excited on that day. We got at the school a little early because i don't stuck in the traffic. Good to know that my kid is being polite and nice. A night before we asleep he keep talking about his school. He was asking me if he still go on the same school that he went last year and i said nope. your going in other school and that school we go to is quit bigger than the old school you had he is really serious listening to my story. 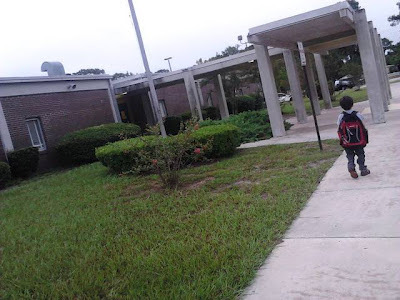 I tell him about the school, discuss what we going to do in the first day of his school. his packpack is get so heavy there were many school stuffs so i would carry it only in first day later on he would not having a hard time to carry his packpack. The first day on his school is went great. I don't have any problem on his school. How about you does your kid stranged at day one?